I know I’m new to the whole “stay at home parent” world. Only playing for a month now, I’ve had some big hurdles to clear, but it has been very rewarding. I’ve found by planning each day, the girls are in a much better mood. There is a LOT of housework to be done. Creating a special tool to manage the load has helped tremendously though. Lastly, our family time is much higher quality as we’re able to spend time together instead of doing all the chores, cooking, and other mundane tasks we had to put off until we were home. Being a stay at home parent is a lot of hard work. However, it’s very rewarding knowing that we get to be the primary influence in our children’s lives. Before we made the jump to me staying home, the girls were in preschool at an in-home daycare. We loved the progress that the girls have been making, but we didn’t really know what was going on during their day. We knew they were getting school time, biblical influence and great social skills but we didn’t know what their day to day was like because there was not a lot of communication and our daughters weren’t telling us much. Now that I am home with them, I have control of what they are doing and can record it so that we can look back on it together as a family over dinner and family time. Just a sample of what last week looked like. Keeping track of their day to day has allowed us to go over the day together as a family. Planning has been essential in my time as a stay at home dad. Having events to look forward to as well as down time on the calendar helps me focus on the moment. With a plan in place, I’m not worrying about how to fill the next hour for the kids. I’m enjoying the present and move from activity to activity with them. Planning ahead of time makes it much easier to curb boredom and not get stuck doing the same things. Plus, when I plan, there is not as much screen time involved which most people would agree is a great thing! Before staying at home, I thought I’d have more free time. In fact, the opposite is true. I have less free time to do my stuff because I’m focusing on two kids that take advantage of any weakness they find. Actually, just a couple days ago, I had put them both down for a nap, my 4 year old in her room and my 2 year old in my room. Everything nice and quiet, I just made my cup of afternoon coffee and settled down to get some writing done. However, when I went in to check on my youngest, I found her covered in baby powder and red lip stick! Quietly, she snuck (interesting story about the word snuck vs sneaked) into my wife’s makeup and spread it everywhere! In hindsight, I wish I would’ve taken a picture, but I was quite angry at the time cleaning it up. Also, by keeping a calendar for planning, it allows my wife a glimpse into our day. From there, she can provide input about how we are spending our time. This has really been a blessing for us to be more influential and have a bigger role in how our children are spending their day. Part of this stay at home gig includes completing the housework. It actually is amazing how much cleaning and maintenance goes into keeping up a house. Back in 2015, we actually made a Google calendar with a bunch of repeating events each week that would break down the household chairs into chunks of three to four events a day. If I didn’t have a plan for the chores, I would be overwhelmed trying to do everything at once. This strategy of doing the three to four things on my calendar Monday through Friday has really made it seem like a non issue. I get to involve the girls in the cleaning too, as it’s never too early to start training them on how to keep house and clean up after themselves. I usually have all these done before my wife gets home. Plus, we don’t have any chores to do on weekends. I do still mow the yard, do some laundry, do dishes and other everyday things on the weekends. This new system doesn’t feel nearly as overwhelming as it did before. We had a fun family day going out to the Bristol Renaissance Fair. Here my wife and kiddos are making gigantic bubbles. We are finally able to put family back into family time. For a while, we had adopted a few others into our family time: housework, cooking and high strung schedule management. We are now able to relax more when my wife comes home. I usually have dinner ready and the chores done. The girls are no longer in an Olympic sprint, usually getting ready and out the door in fifteen minutes either. They sleep in until they are ready to get up usually between 630 to 730 am. We are able to focus more on each other instead of what needs to be done around the house. When my wife comes home, the girls are very excited to see her, freeing me to finish dinner. We’re finally focusing on doing family activities in the evening. This wasn’t really possible without sacrificing other things off in the past. Like tonight, we did a family painting night where we set both the girls up to paint some fun worksheets. We had a lot of fun doing it and I believe it was a fun, family activity. Becoming a stay at home dad has been one of the best decisions for our family that we’ve made. We now are active in planning our children’s activities together. We tackle more of the housework with less headaches and more time and energy to spare. And we enjoy having family activities in the evening because we aren’t trying to cram everything else in. I am looking forward to continuing my stay at home dad journey for the next few years at least. It may be hard, but it’s so worth it! Posted in Family, Family Finances. ← How is Your Financial Health? Thanks Christina! I try to be organized, it does really help, I think it comes from me liking to record everything! Yes, the free time thing is crazy! I 100% agree with your assessment on free time. As a home-schooling, SAHM any extra second I think I might have gets eaten up so quickly. But as you said our family quality is at its highest its ever been. We love spending time together! I love all your organizational suggestions. I might have to incorporate some of them into my day. Thanks for sharing. Thanks for stopping by Elizabeth and thanks for the encouragement. It’s hard with all the time we have to put in, but it’s so rewarding knowing that we are the primary influence in our children’s lives. The calendar for organization has really helped us keep our sanity. Get it! I plan too! I have a cleaning schedule for every week. I love lists and calendars. Not everyone functions that way though. I love that you are spending so much time with your little ones. I can’t imagine just how happy I would have been to have my father to myself all day. Awesome post! Thanks Rachel! I know that this time with them is going to play a big part in them growing up (hopefully for the better, I say jokingly). That’s awesome,that one of you gets to stay home. I wish others would see how important family time really is. Mihaela, thanks for stopping by. Yes, even though I’m only in my fifth week staying at home with the girls, we have already noticed that they love having me home! Thanks Amanda. I’m doing what I know how and learning from others all the time! definitely enjoying the time with them! Thanks for reading! Omg God bless you! You have caused me to re-evaluate my life and I don’t even have children, so much organization and structure. What a wonderful blessing! Finding what is right for your family and then seeing the benefit in it is fantastic! Way to go, SAH dad! 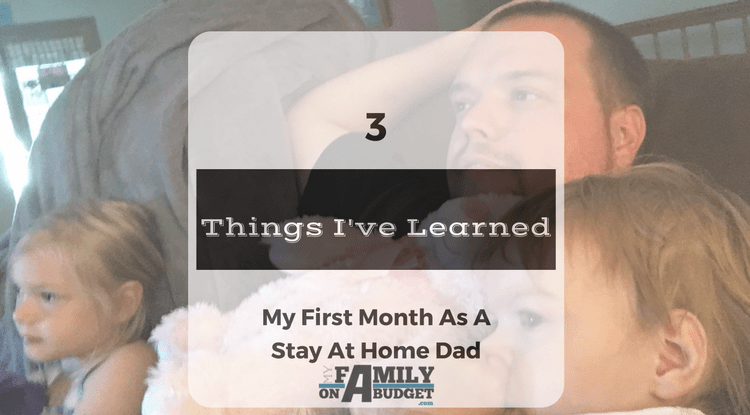 It is so interesting to hear the dad perspective of balancing the family time vs. chores. Keep up the good work! My husband is taking the year off of work with me. It’s is a lot, even for two people. Although we have 5 little ones at home. The house work is crazy. 15 loads of laundry a week. But it’s been amazing to actually be able to do fun things, like go to the lake or hiking. We did a 6 week road trip this summer. The kids love having us both here. Wow! That’s awesome that your family is able to do that! It is awesome to be able to have that extra time to enjoy life when we aren’t so worried about making a living! Thanks for stopping by and commenting! I can relate to so much of this. Just recently we put our girl in pre-school 2 mornings a week AND Carrie’s mom moved to town. She takes our girl Mondays and Wednesdays. It’s a great situation now, but on the days when I normally would have had her all to myself I miss her a ton. It’s great to be able to return to doing more work, but I do miss her. Anyway, great post. Especially the planning part. You are so right that planning helps to structure the days and avoids the boredom. derek recently posted…How pretending to spend $100,000 will help you and your spouse manage your money. Sometimes when we are in the thick of things, we don’t realize what we have until it’s gone. Being home with them all day, every day is kind of hard, but worth it. I am still feeling kind of guilty because I’m not really bringing in any income. But I know that my responsibility is not to bring income, it’s to give our girls the best experience that I can right now. My wife keeps reminding me that there will be plenty of time for me to work and grow my business. I am still learning to be content with where I’m at on this level and to just slow down and enjoy things more. We are going to start finding ways to get me a break here and there by letting the kids spend more time with family and allow me to work in that down time. This will help me immensely as I won’t feel the itch to be writing and commenting and networking instead of playing with the girls. I feel like I’m pulling myself in so many directions, but I think it will all lead somewhere positive in the end! I don’t know how I’m going to react when I actually won’t have them around as much, to tell you the truth! I might just be like you where I miss them a ton, but it will be good to get things done as well! Thanks for stopping by and thanks for the positive comment! Yes, I didn’t make it all work on day one. But, little by little, I’ve been able to accomplish more each month as I’ve gone along. Having a plan and following through is definitely pivotal though! Thanks for stopping by and I hope it’s going well on your end as well!